Sam Spolo is an agent with American Intelligence. "My name is Sam Spolo and officially I do not exist nor do I have a title. Unofficially, I am known as the Spy Smasher. Any place in the world where our interests are threatened by the presence of an enemy spy ring, that's where you will find me. I may be called upon by any agency of the United States or, in turn, I may call upon them for help. I am almost a lone wolf and I have but one assistant, Ben Riley. When needed, we have unlimited funds and unlimited power." Words of a similar nature begin each of the adventures of Sam Spolo. This description will change a bit here or there as time goes by. The people who might request the services of Spolo will get extended towards the end of his recorded career to include nations friendly to the United States. His mission remains the same, though, and when he talks about "any place in the world" he most definitely means it. Europe is his most common destination but he truly goes all over the place. His sole assistant will change a third of the way through the series to become Ben Manners [I do not have he story and reason for the change]. Whether it is Riley or Manners, the role of assistant is by no means that of a flunky meant only to admire and praise his boss - each Ben will useful information or suggestions to aid Spolo in coming up with a solution. It is a rather good relationship. We learn very little about Spolo in his 30 adventures - certainly nothing of his past. We can see that he is very intelligent and highly observant. He can and does discern clues that are so part of the background that most miss them. He is logical enough to take a couple of facts and reach a correct conclusion, hence his tremendous track record of successes. We also see that he is by no means an automaton. He can be surprised. He can joke and enjoy himself. He is not above the occasional vacation or R&R trip to unwind. He has an appreciative eye for a pretty lady. Mostly, though, we know he enjoys his job and he is very good at it. 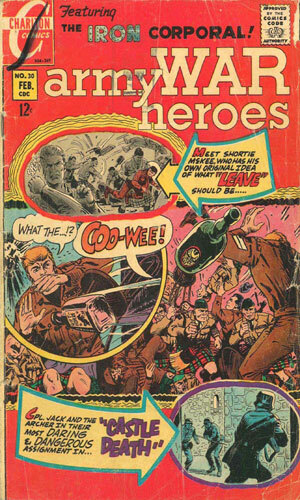 Note: Apparently the covername of Spy Smasher is a popular one. In 1940, Alan Armstrong donned a cape and goggles and started smashing spies under that moniker. 60+ years later his granddaughter would not dress so oddly but would also take the covername as she went about smashing spies. In between, Sam Spolo, of no obvious relation, called himself that as he flew around the world smashing spy rings. 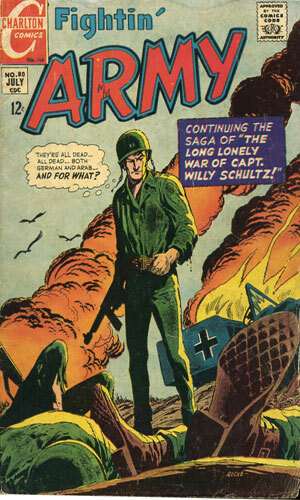 Note: The creator of Sam Spolo remains unverified but evidence points to it being Joe Gill, a very prolific comic book and short story writer who worked for Charlton Comics during this period and was known to have written text stories for that company's Fightin' military line. As a result I have credited him as such. If I am wrong, let me know. 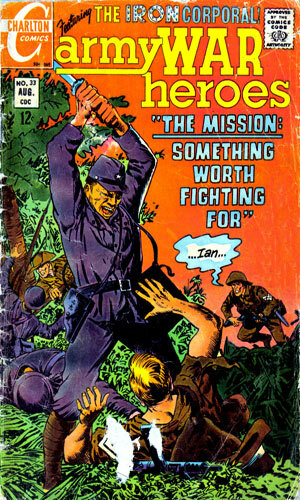 It was not unusual for comic books to include the occasional prose short story along with the illustrated adventures. Usually, though, the prose would complement the graphics, in that the hero would usually be in a graphic adventure but once in a while show up in a text adventure. Not so with Sam Spolo. 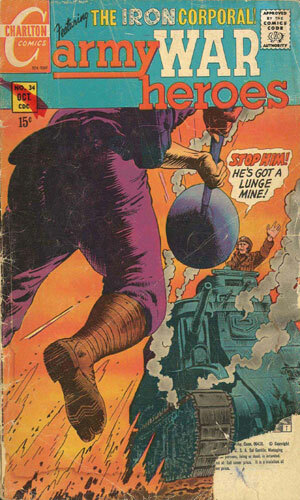 This Spy Smasher (his term, not mine) did not ever, as far I have seen, appear in a comic form but each of the 30 one-page adventures would be found in a comic book. The appearances were not, though, a common occurrence and they were not limited to one magazine. 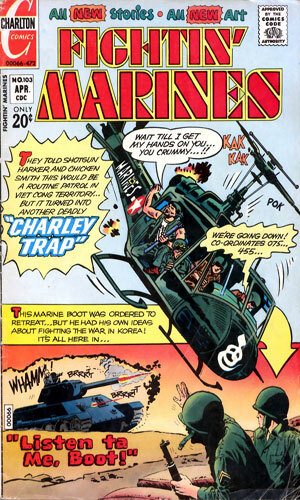 Charlton Comics had for many years several comic lines concerning the struggles of many men and women in uniform, most of them taking place during the Second World War but some going on in Korea and later still. 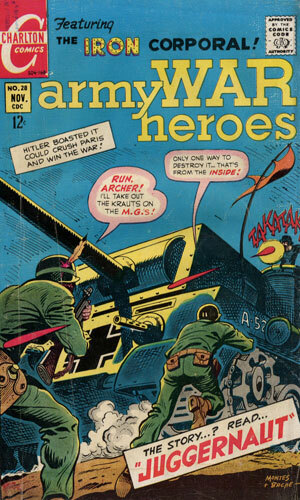 Army War Heroes, Fightin' Army, Fightin' Marines, and Attack! were the four of those publications which would be graced by the exploits of Sam Spolo. All of the Sam Spolo tales are anonymously presented. I have no idea as yet who created or penned him. If someone out there knows, please drop me a line. Of the 30 tales (as far as I know), 27 are available here so I can tell you about them and you can read 'em. I know in which magazines the others showed up but as yet I do not have a copy of those issues so have not been able to read the tales. Again, if someone out there has them and would like to scan the Sam Spolo story for me, I would love to include it. For your reading pleasure, I have included a scan of the actual text for each story I have found. To read it, click on the image below and then scroll down. 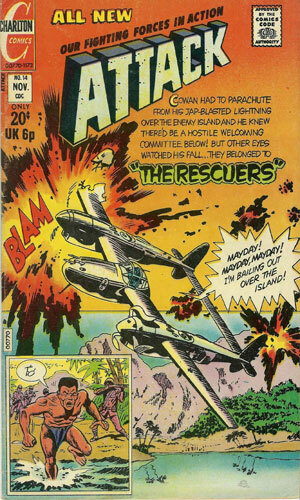 From Fightin' Army #77 - Sam Spolo is in Vietnam trying to find the spy in a tightly closed base. 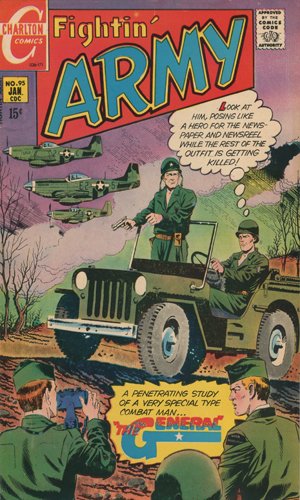 From Army War Heroes #24 - Spolo and Riley travels to West Berlin in answer to a request by Colonel Harlington and discovers that a typewriter has been rigged to send all of the messages typed to the Germans. The Spy Smasher destroys it and the case is solved. 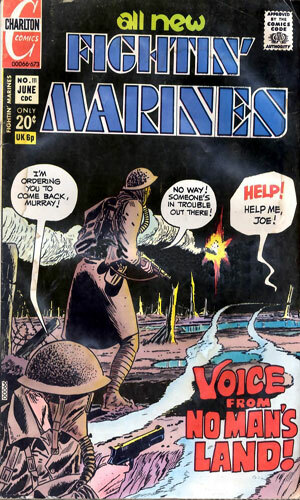 From Fightin' Army #80 - In West Berlin, Sam Spolo is asked to help the British with one of the agents who supposedly had gone to the other side and was denouncing the West via radio broadcast. 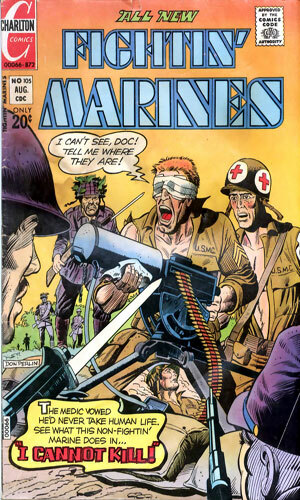 From Army War Heroes #27 - Sam Spolo and Riley are sent to the Far East on a mission. To trap the one selling information they come up with a plan that gets him and all others involved. 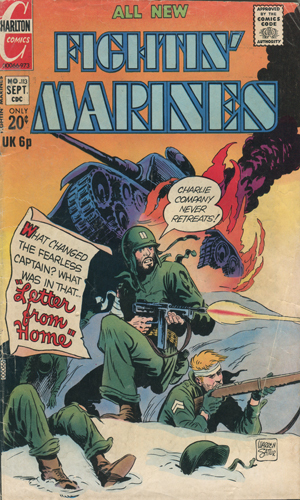 From Army War Heroes #28 - In an unnamed Far Eastern capital, spies had gotten into and burglarized the highly guarded offices on the 23rd floor of a building. How they got in was up to Sam Spolo to determine. From Army War Heroes #30 - Back to West Berlin where enemy agents were killing diplomats in odd traffic accidents and it was up to Sam Spolo to stop them. 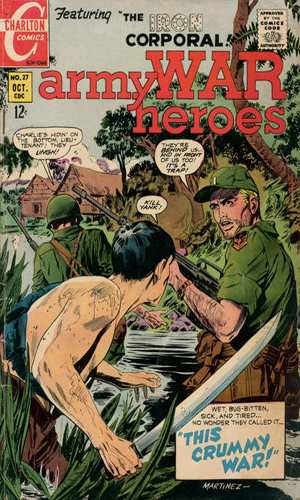 From Army War Heroes #32 - Sam Spolo and his assistant, Riley, are sent to Honduras to check on a prisoner there that might be Hitler's former Gestapo Chief. 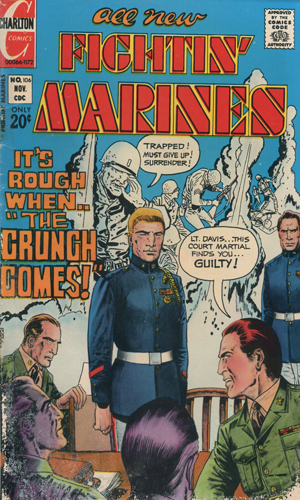 From Army War Heroes #33 - An up-and-coming Russian ballerina is suspected of passing vital secrets back to the USSR and Sam Spolo is sent to West Berlin to learn who is doing what and stopping it. From Fightin' Army #87 - A Communist top spy wants asylum and a million dollars for a list of Red agents. Sam Spolo and Ben Manners fly to West Germany to make the deal, yet all is not as it seems. 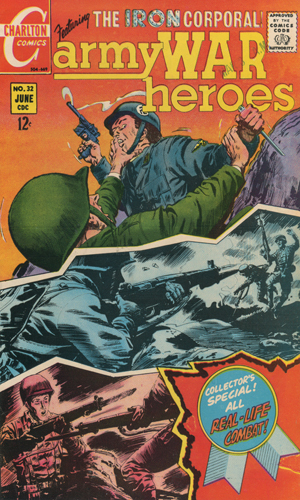 From Army War Heroes #34 - On vacation in Switzerland, Sam Spolo is pulled away to (London) to help prove if a high-ranking Lord is really passing vital secrets to a Russian ballerina. 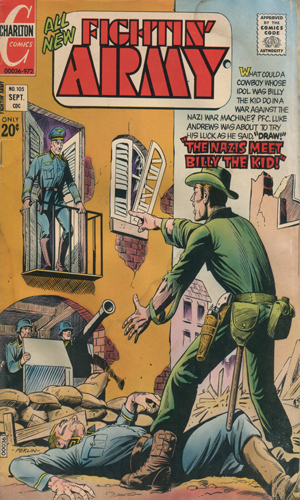 From Fightin' Army #88 - The Spy Smasher (aka Sam Spolo) and his assistant (aka Ben Manners) are called on a mission with the password "Bolobolo" and soon are once again in West Germany to find out if a Admiral is selling NATO secrets to the enemy. 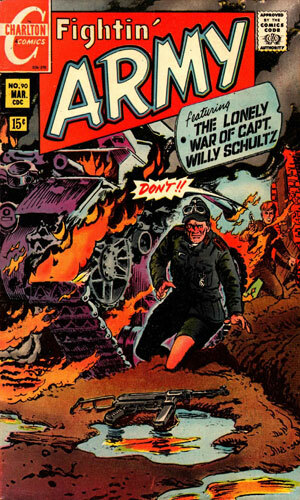 From Fightin' Army #90 - While in London advising Scotland Yard, Sam Spolo is pulled again to West Berlin to help in a case where a man from East Germany was caught smuggling state secrets out of his country. It is up to Spolo to figure out to whom the info was headed. From Fightin' Army #92 - The Soviets were suspected of using a famous circus in Europe to pass info and orders to its agents but how it was being done was unknown. Sam Spolo takes the role of a tv producer to scope out the truth. 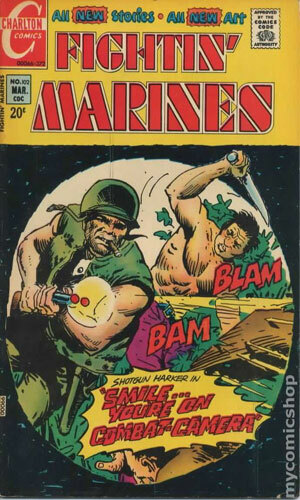 From Fightin' Marines #93 - Sam Spolo, the Spy Smasher and his assistant are in Africa to help a new republic keep their new found oil out of the hands of Communist. 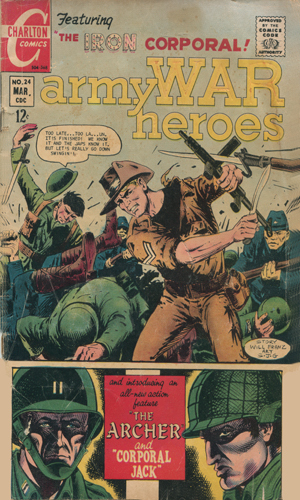 From Fightin' Marines #94 - Sam Spolo and assistant (Ben Manners) meet Major Simpson at Willow Galleries that exhibits art. He informs them that their mission is to clear an old friend (Colonel Kemper) of killing a man with his car. So back to West Germany they go. 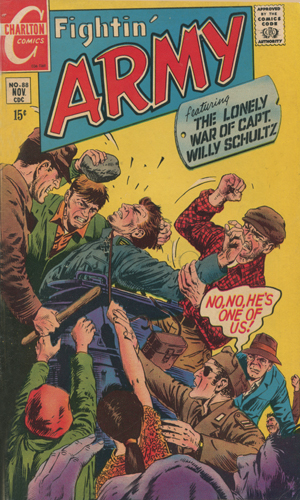 From Fightin' Army #95 - The Spy Smasher (Sam Spolo) and his assistant are visiting a friend when they are called on another mission. A woman is coping information and handing it off to someone. But who? 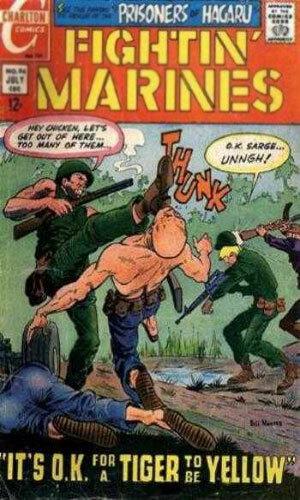 From Fightin' Marines #98 - Sam Spolo and assistant are trout fishing, but are meet at the lake and go back to D.C. to for another mission. A private meeting has been taped and the Spy Smasher must find out how it was done. Clues point to flowers and pins. 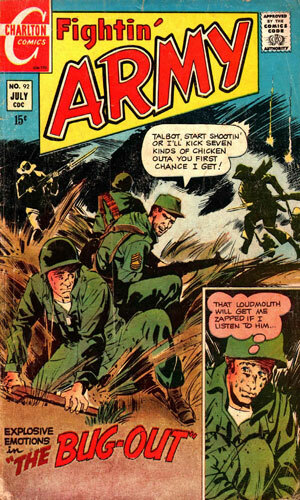 From Fightin' Army #99 - The Premier of a Far East country, an old friend of Sam Spolo, is certain the wife of that nation's Prime Minister is a communist spy and he pulls Spolo away from a date to help prove it. 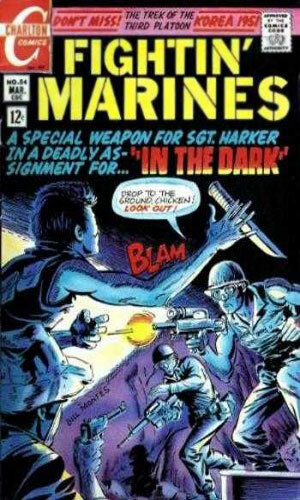 From Fightin' Marines #102 - A Communist spy killed in an accident had secret documents on him. The question was how did he get them. Sam Spolo is sent to a ski resort pretending to be a billionaire to find how the info was being transferred. 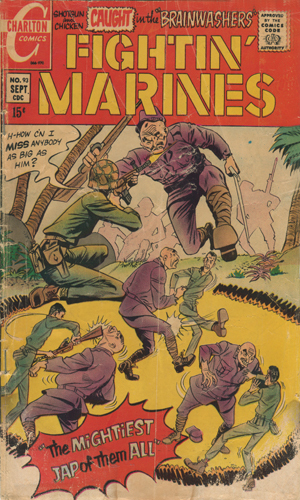 From Fightin' Marines #103 - The Premier of a Far Eastern country, a man who had studied in the US years before and worked at a golf course, wanted to return there during a visit and hit a few balls. His biggest rival vowed that he would die while doing so. Not wanting to lose face, the man was proceeding and it was up to Sam Spolo to keep him alive. 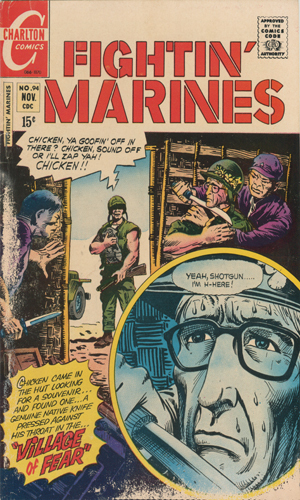 From Fightin' Marines #105, reprinted in Fightin' Marines #146 in 10/1979 - Sam Spolo explains some of the things he taught a class of agent recruits about the methods used by couriers to hide their cargo. 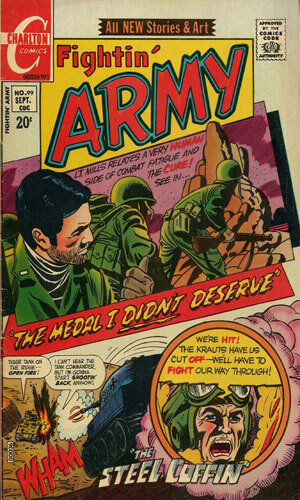 From Fightin' Army #105, reprinted in Fightin' Army #145 in 04/1980 - While visiting a flower exhibition at the Botanical Gardens Sam Spolo and Ben Manners meet their friend Colonel Louis Gardner who has a mission for them. They must discover if a defecting spy was a plant. 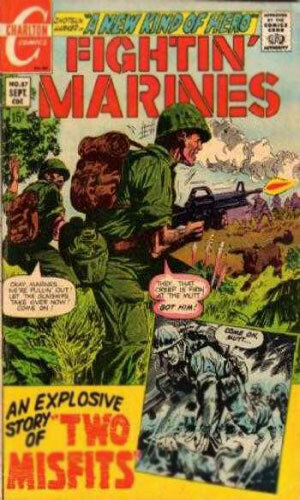 From Fightin' Marines #106 - The man known as "The Spy Smasher" unofficially, Sam Spolo has another mission. President Tukahana faces a case of blackmail by another in his new country with a tape recording. From Fightin' Marines #109 - A double agent reports that a member of Washington's high society is really a communist agent. It is Sam Spolo's task to prove it one way or another. 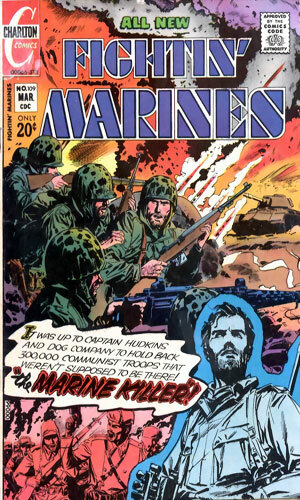 From Fightin' Marines #111, reprinted in Fightin' Marines #144 in 07/1979 - The agents of an unfriendly nation are using knitted sweaters and scarves to pass orders and info. 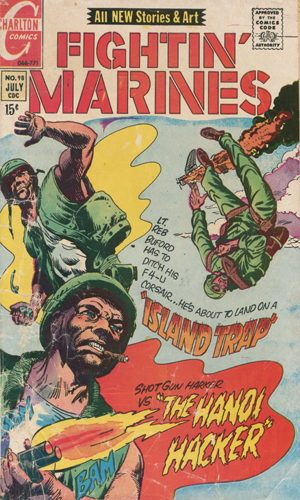 From Fightin' Marines #113 - Sam Spolo, the man who officially does not exist and his assistant are given the task of catching a master red spy named Silverski aboard a plane. From Attack! 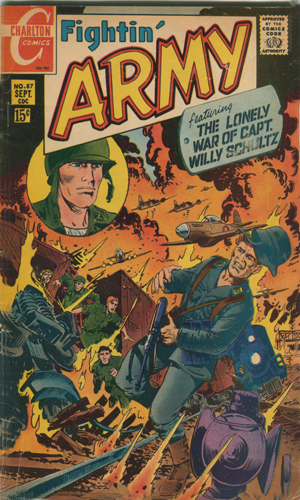 #14 (5th series) - A general appealed to Sam Spolo to help investigate the theft of a new atomic rifle but Spolo is already aware of it because it was he who ordered it stolen - and sold to an enemy power. 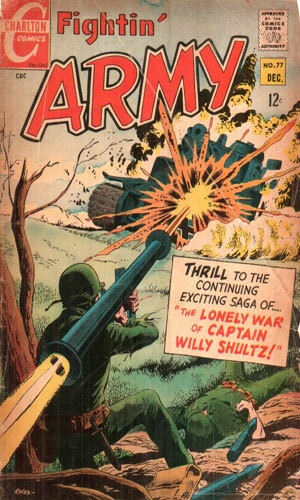 It is interesting that Charlton Comics chose to put Sam Spolo adventures as filler in military oriented comic books. Did they happen to have a couple dozen one-page stories lying about that decided to not let them go to waste? Don't get me wrong, or at least too wrong. I enjoyed the stories and had fun the few minutes each took. However, it seemed odd placement. Also odd was the fact that they were spread about so much. Listed as they are on this page, it is easy to see when they came out and in what magazine they were found and it jumps about between three main one with one more going solo to a title. If you were hoping to follow the Spolo missions in order, boy did you have your work cut out for you. And I cannot say with much confidence that I got them all. I think I do but who knows! Well, despite the strange placement and the even stranger title-bouncing, I got a kick of them. There was not much to them, naturally, since they were just one page long but they amused me for a couple of minutes and that was good.